The city of love was one of the first international cities to feature in our FvF network in 2011. Since then we have released 14 portraits from the French capital and for over a year, our contributing editor Léa Munsch has supported us with her writing skills. Léa has helped to introduce FvF viewers to the flourishing creative scenes of Paris, its beautiful architecture, various neighborhoods and homes of special Parisians. This sweet mademoiselle has been involved in four interviews in Paris that include: Art director and architect, Louise Brody and Charles Poisay, glass blower, Jeremy Maxwell Wintrebert, designer, Céline Saby and graphic designer and illustrator, Leslie David. Growing up in the renowned wine region of Alsace that hugs the border of Switzerland and Germany – known for its standout Riesling – she moved to Paris to pursue her career. Today she works as a creative manager in a range of cultural spheres. Léa keeps her finger on the pulse dealing with contemporary artists, photographers and graphic designers, and is thus the perfect candidate to provide FvF with inspirational stories and portraits. When she is not busy exploring her own city, her love of travel takes her on a range of different adventures that includes embarking on her annual summer trip wherever the road takes her. We get to know Léa a little better in her Meet the FvF Contributor’s profile. I’m a freelancer who offers services in creative management. My aim is to work closely with creatives such as designers, photographers, graphic designers and artists. I help them manage everything that is non-design related and maximize their design time, helping develop their activity. My morning ritual is really important. I have a bowl of cereal and a nice fresh juice, watch some of the “things” that have come in over the night on the Internet. Then I walk to work. One of my clients has a studio 20 minutes from my apartment, which is a real luxury. I take different paths, I learn new street names. I like noticing details and watching people. So now instead of reading something on the bus like I used to do, I do that instead. I’m always on the lookout for new places: to relax, to shop, new cultural places of interest. Paris is so diverse and full of places to discover with new ones popping up regularly. To relax, I stay at home. To get inspired, I go to an exhibition, or try a new restaurant. Sometimes my boyfriend and I randomly pick a place in Paris that we don’t know and explore it. I like to do that when I take pictures, because you’re seeing new things, new people…it’s stimulating. What’s your favorite picture on FvF? I love this picture of Tracy Wilkinson. It is a calm, feminine, crafty environment. It seems like time is somewhat suspended. The house and the city she lives are really different than mine, but I can somehow relate to it and I feel a familiarity with this image. What was your favorite interview in Paris? As my intention is to get to know, within a few hours, who is the real person behind the face you’ll see on the pictures, each interview is a very special encounter. The other day I stumbled upon hand written notes I had taken while interviewing Jeremy Wintrebert. Almost a year later, they were sharp enough to describe impressions that brought me back to that day. Looking at all the international portraits, I remember being mesmerized by Jessica and Simon in New York. They looked confident in themselves and as a couple. Building simply day by day, their home, their projects and shaping a life that they feel happy with. I think my attitude toward technology is average for someone part of generation Y. It definitely makes things easier and offers incredible possibilities, like building an international network of contributors for FvF. More and more things only exist now digitally but as a real magazine buff, I still have a special relationship with printed matter. Sometimes I wonder what people did before the Internet and computers, and moreover, how the next generation with all of this technology will consider the pre-Internet era. For four years now, I have always made a road trip in summer. This year we drove 4,000 km from France to Romania. I love spending time on the road and living in nature. The highlight of this summer was our stop in Romania in a campsite in the northern part of the country. The farming village life in Breb is a retreat far from the fast paced activity of a city. It is like stepping back in time. I felt like I could finally relax. The only rhythm shaping the day was the path of the sun. Music: Cashmere Cat a young Norwegian producer who brings some cat love on the dancefloor. Boston Bun, a young French producer/director with a first EP on Ed banger records. I love his vocal samples and bass lines. Saint Lou Lou beautifully eerie single “Maybe you“. They are two swedish twins with a 1970’s black and white aesthetic. Art: The incredible exhibition “the museum of everything” that took place at Chalet Society in Paris. A gathering of art brut and L’art naïf pieces. The setting of an old factory contributed a lot to the setting. I’ve seen nothing comparable in Paris recently. Design: Carlo Mollino, thanks to the German gallery owner Ulrich Fiedler. I looked into articles about the mysterious life of this Italian designer, photographer, pilot and inventor. I also follow the work of emerging young guns, and each interview I conduct is a great encounter. 20-30 something people who change their lives, quit their jobs and studies with the aim of learning a traditional craft. I am curious about this urge to return to craftsmanship and discover a sense of authenticity. Pizzas at la Briciola, on rue charlot in the Marais, Paris and Japanese food at Sanukiya, between the Opera and the Louvre. List three websites – more or less – you visit daily ? It is hard to list just three. I visit gmail, facebook, Instagram and google reader. I also use moco loco and monoqi. What was the best advice you have ever received and by whom? It was from my boyfriend years ago: ‘Grow your self-mockery’. There would be many names to list. But my idea of FvF is to feature people with potential. There are thousands of passionate people with incredible skills and ideas to feature because of who they are and what they do, not just because they have something coming up that is newsworthy. What I try to bring to the portraits is a connection, a way to get to know the person beyond the creative and that is where FvF allows contributors to go. 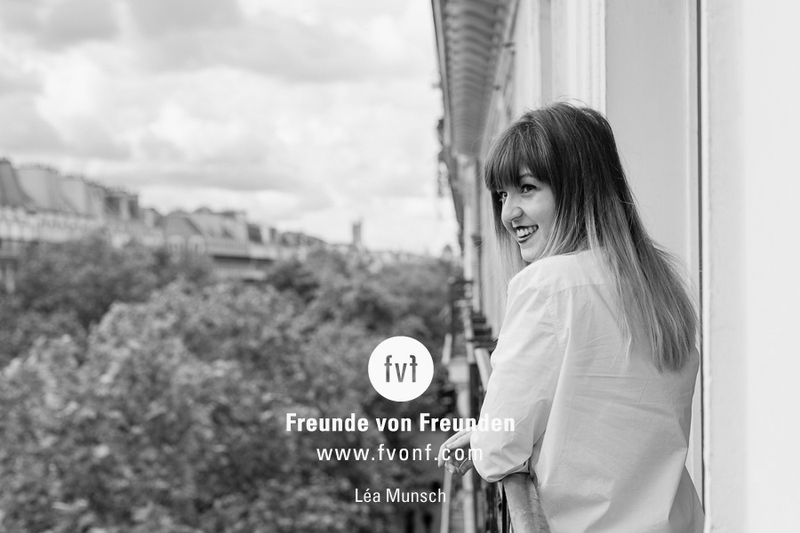 Thank you Léa for being part of the international team that makes Freunde von Freunden possible! We are looking forward to continue collaborating in the future.